In 24 hours, a rare bacterial infection turned healthy 17 year old John Tartaglio to a double-leg amputee, but 15 hours and 59 minutes is all that it took for him to reclaim the life that he had left behind. 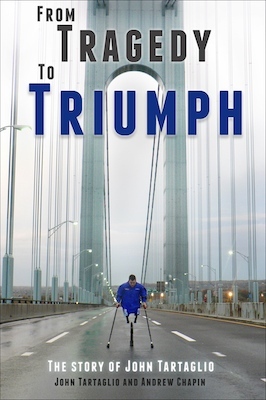 From Tragedy to Triumph is his story of perseverance over a heartbreaking circumstance as incomprehensible as it is seemingly insurmountable. Amputated up to his hipbones and told he would never walk again, John did not give up on life. Instead, he rose to do what others said he could not. Walking, running, competing, but most importantly living, he proved to them what he had always known- his disability did not define him; he defined his disability. From those with mobility issues who need to be reminded that living an independent life is possible to the athletes who need to push and challenge themselves that much more and everyone in between, From Tragedy to Triumph can positively impact your life.